Herman Mitchell is one of the unsung heroes in the history of Maine On2 modeling as he was a highly skilled pattern maker who produced the master patterns for castings which were sold or used by Scale Railway Equipment Company, Bob Werner and his businesses of The Hobby Barn and Portland Products, LeeTown Model Services and numerous others. 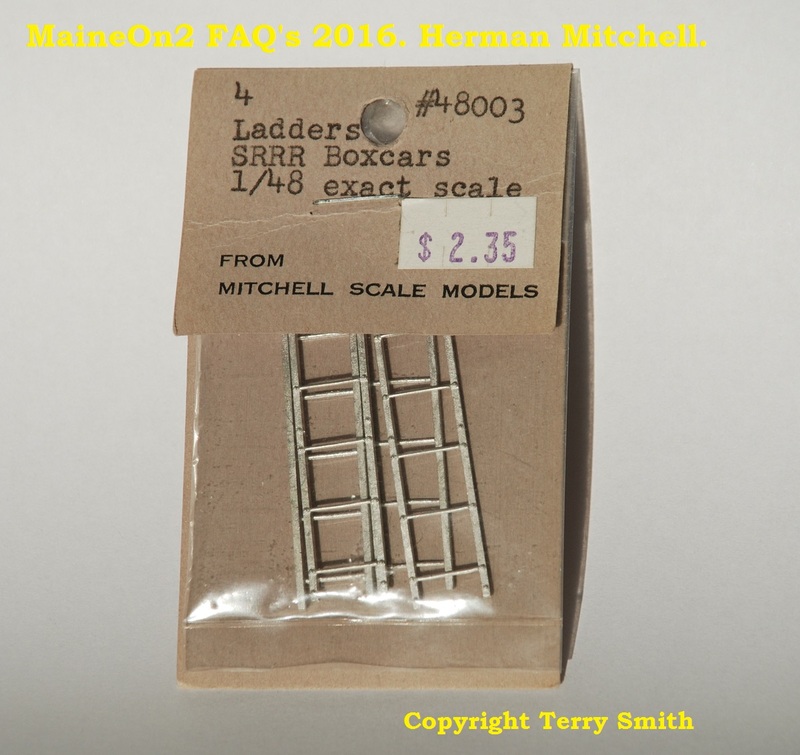 Herman also sold some of his castings under his own Mitchell Scale Models label, such as the SRRR 5 rung boxcar ladder shown above. My good friend Herman (Mitch) Mitchell passed away at his home near Farmington Maine, May 4th. He was 91. 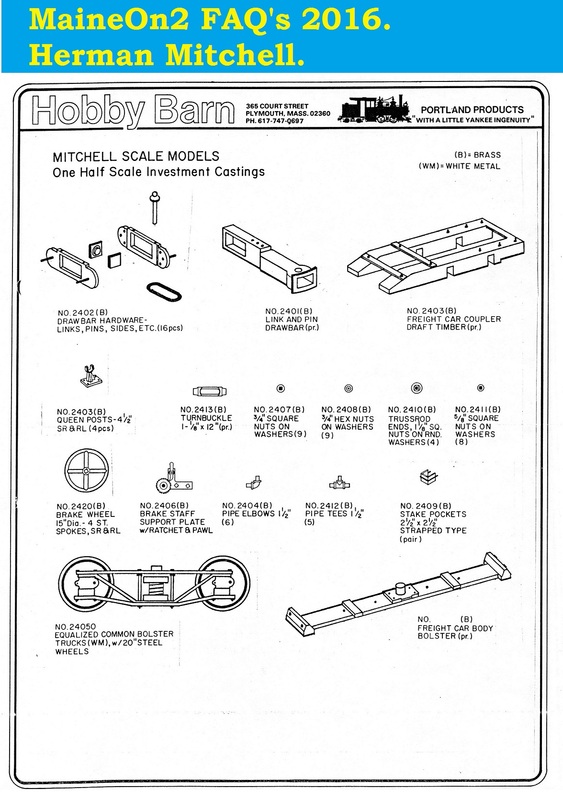 Mitch formed Mitchell Scale Models back in the early sixties and built models and components for a number of US firms. He was born in Germany, but left at the age of 18, emigrating to Long Island in 1937. He trained as a professional pattern maker and machinist. After a chance trip to Phillips, Maine in the mid fifties, he moved his family there from NYC, as it reminded him of the countryside he grew up in. Over the years he did numerous patterns and offered castings in 1/4″ and 1/2″. Many of his two foot patterns were used by Portland Products and Scale Railway Equipment back in the 70’s and 80’s. His craftsmanship and attention to detail was first rate. He was a true pioneer in Maine two foot modelling. Earlier in March 2007 Wes Ewell wrote;- Mitch Mitchell is an extremely capable retired machinist who produced most of Bob Werner’s masters. Bob Schlechter and I met him at a WW&F picnic eight or nine years ago, but I haven’t seen or heard about him since. 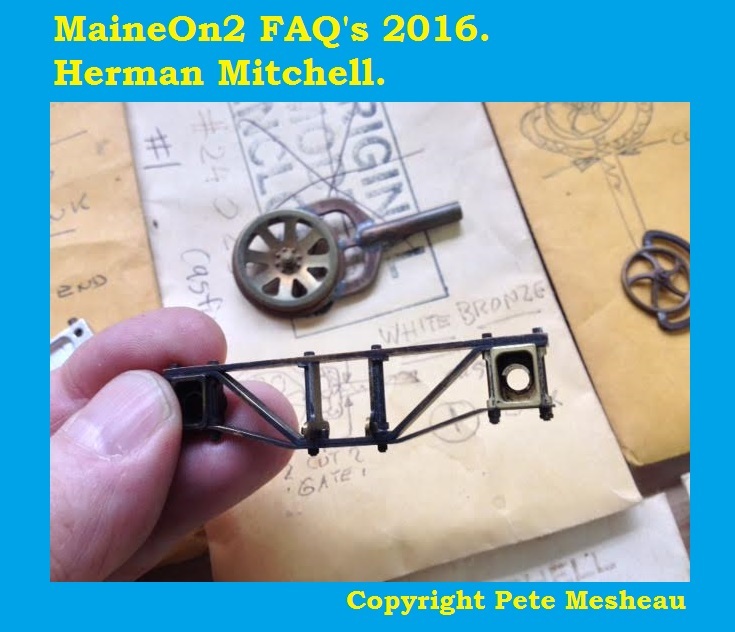 In 2016 Pete Mesheau wrote;- Mitch offered a few 1/4″ parts that he did up himself but for the most part, his On2 work was for Portland and SRE. His parts were cast at a small Rhode Island foundry. The 40 odd 1/2″ scale two foot patterns (pictured below) are still with me, along with a number of 1/2″ parts. 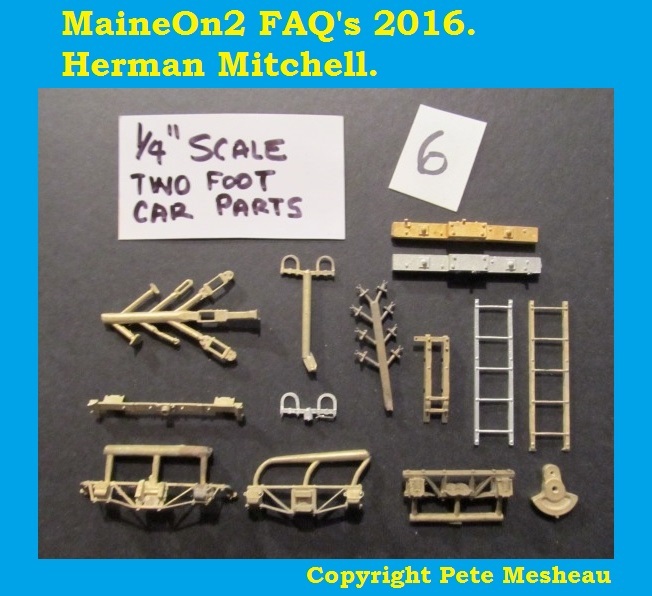 Mitch did many On3 patterns as well, and a number for 1/4″ and 1/2″ scale street cars. 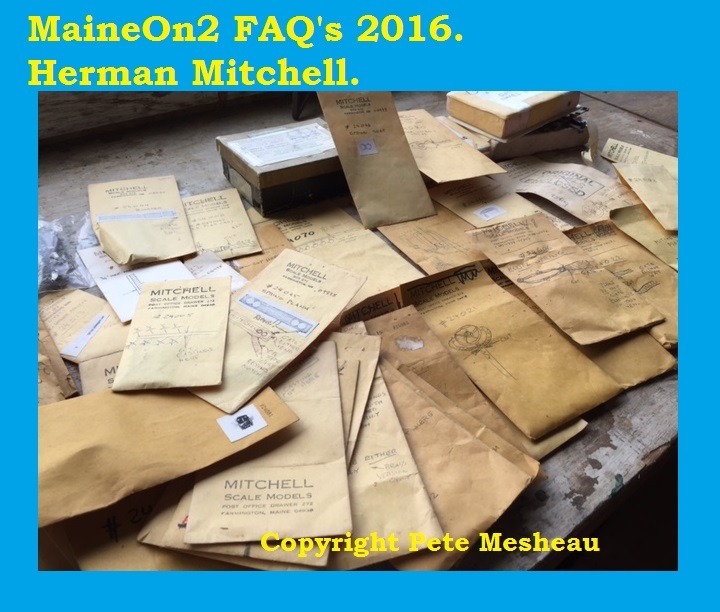 An overview of the Herman Mitchell 1/2″ scale patterns held by Pete Mesheau. A close up of Herman’s pattern for a 1/2″ scale Maine freight truck sideframe, with a rail car wheel in the background. A range of Herman’s 1/4″ scale patterns with a swing motion freight truck sideframe in the hand. 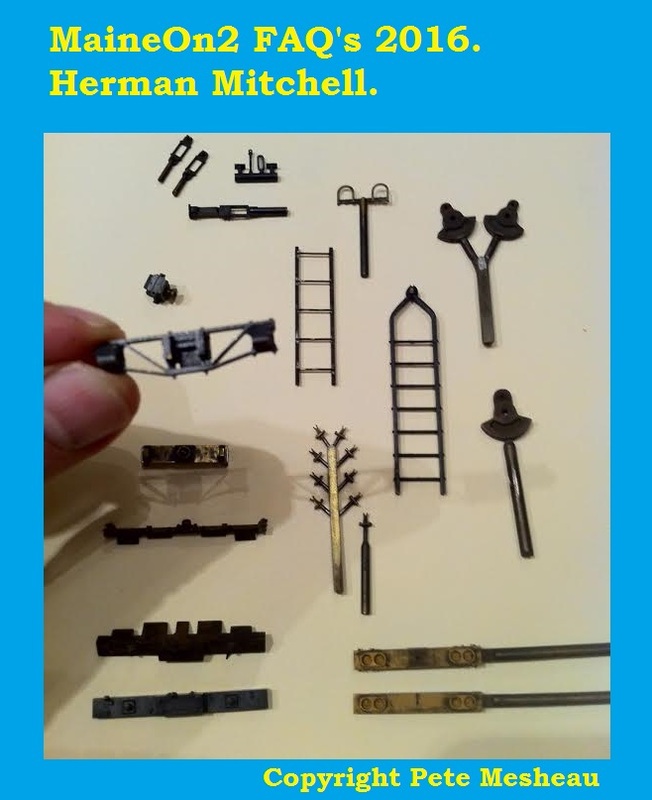 Examples of Herman’s 1/4″ scale parts in brass and whitemetal. The truck sideframes across the bottom are from the SRECo range. Some more of Herman’s 1/4″ scale parts in brass. 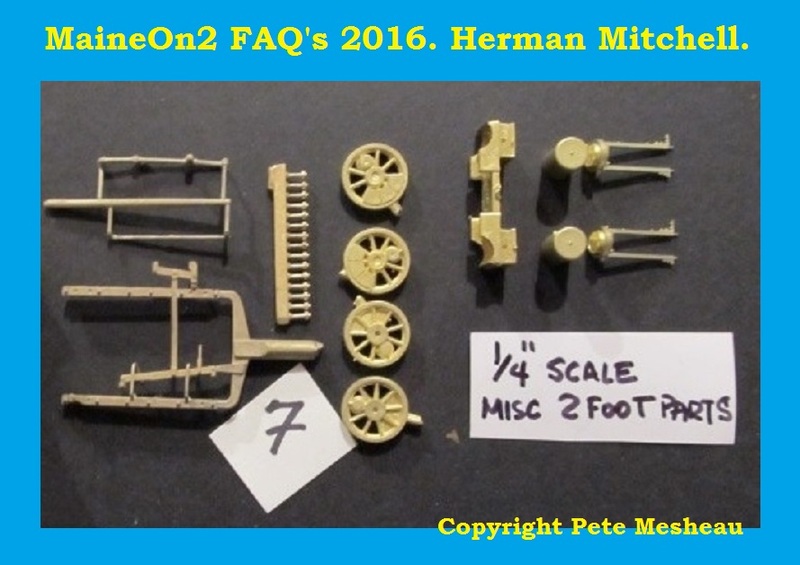 Bob Werner included Herman’s range of 1/2″ scale parts in his Hobby Barn Catalogue. The editors gratefully acknowledge the assistance of Pete Mesheau in preparing and checking this topic.